In 1984, Apple spoofed the classic Ghostbusters song by Ray Parker Jr, and this outrageously cheesy video is the result. The video apparently played as the introduction to an Apple corporate event held in Hawaii to rally the international sales team. 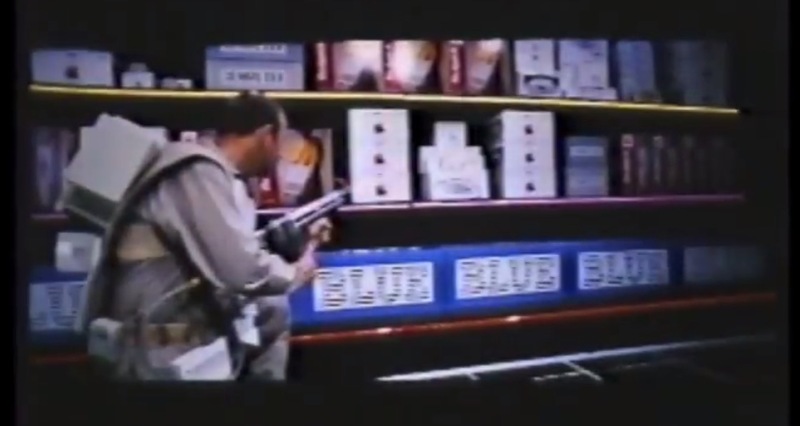 Instead of Ghostbusters, it’s “Blue Busters”, with Blue of course being a reference to Big Blue, or IBM. John Sculley and Steve Wozniak even make appearances in the video, and supposedly Steve Jobs is somewhere in there too as a Ghostbuster along with a few other Apple execs, although I couldn’t identify everyone, if you happen to know them all do leave a comment. So, anyone found that 1985 video yet? We’ve got the “Leading The Way” video from 1984 in the meantime… enjoy that one! Apple history at it’s finest, or funniest at least. Cheesy? Perhaps by today’s standards – but as someone who worked in the audio visual (av) industry for twenty+ years – I have to say that the production was very good indeed. The av company would have shot hundreds of still images on to 35mm slides and use a rostrum camera (probably a Forox, Siccles or Marron-Carrell) to line them all up. Then they were painstakingly programmed on a Genesis system (IBM XT) PC. This would control a bank of 9 or so Kodak Carousel slide projectors, which, in this instance were all focused onto a single screen. I am an old professional of ROSTRUM CAMERA and for me this audiovisual is an old treasure. And I think is an overlap.